Peachtree Publishing Company, 9781561454907, 1pp. A mere nine months have passed since the September 11 attacks, and hearts are raw as these legendary Maasai warriors offer their gift to a grieving people half a world away. Word of the gift will travel newswires around the globe, and for the heartsick American nation, the gift of fourteen cows emerges from the choking dust and darkness as a soft light of hope--and friendship. This New York Times best seller recounts the true story from Wilson Kimeli Naiyomah of a touching gift bestowed on the United States by a tribe of Maasai Warriors in the wake of the September 11th attacks. 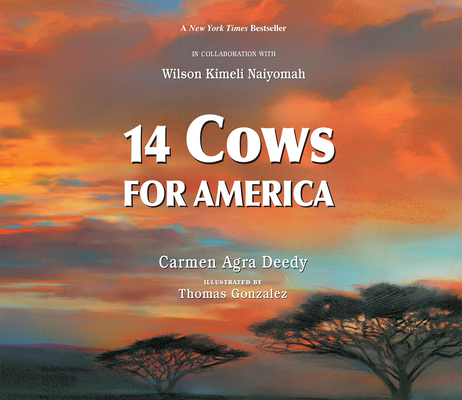 With the stunning paintings of Thomas Gonzalez, master storyteller Carmen Agra Deedy hits all the right notes in this elegant story of generosity that crosses boundaries, nations, and cultures.